Call to place your order and/or to discuss Material and Size selection that will best meet your needs. These are authentically designed Sioux and Cheyenne tipi's. These are for year round use. Great for Powwows, Pageants, Camps, etc. All seams are double-sewn. Edges are hemmed unless selvedge is used. Bottom edge is hemmed to keep from fraying. Lacing pin holes are button-hole stitched by hand and no grommets are used. Please note that these tipi's are not painted or decorated. Poles, Stakes, Lacing Pins, Rope, etc must be purchased separately. Note: The diameter of the tipi is the size, not the height. For example: an 18' tipi measures front to back 18', side to side 17', height 15'. All Ozans are made of Sunforger material. Poles are shipped via Common Carrier (Truck). Freight charges are considerable, due to length and weight of the poles. We can obtain an actual freight charge for the shipping of poles only with a complete address. Freight charges are ESTIMATED to be between $300-$500, based on actual destination. Tipi's do not come with Stake Loops. If required, they can be added for an additional charge of $5.00 per Stake Loop (1 Loop per foot: e.g. 16 ft Tipi = 16 Loops, 22 ft Tipi = 22 Loops). 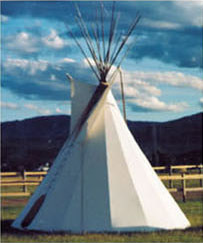 Grey Owl is the distributor for a manufacturer who has been producing Tipi's and Tents for over 30 years. The quality of materials and workmanship that go into the products they produce is second to none. Sunforger Flame-retardant Material is treated with CPIA-84 flame-retardant, which meets California code and is recommended for all commercial Campground use, as this also meets most insurance liability requirements.